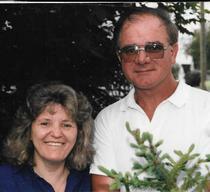 Obituary for James "Jimmy" J. Flieger | Adams Funeral Home Ltd.
James Joseph Flieger, husband of Erma Flieger of Miramichi passed away at the Miramichi Regional Hospital on Friday, March 29, 2019 at the age of 65. Born in Chatham on July 28, 1953, he was the son of the late Arthur and Margaret (Robinson) Flieger. He was a truck driver by trade. He is survived by Erma; two sons: Scott (Sandra) and Arthur (Tammy); three grandchildren: Nathan, Dylan and Derek; two sisters: Alma and Jacqueline; five brothers: Arthur, Frank (Debbie), Michael, William and Paul; several nieces and nephews. He was predeceased by his parents, son James, brothers Donald, Kenneth, Louis and Ralph, sisters Marilyn, Helen, and Jeanette. Visitation was held at Adams Funeral Home Ltd., 140 King St., Miramichi on Tuesday from 2-4 & 7-9 pm. Funeral service was held at Pentecostals of Miramichi, 146 King St., Miramichi on Wednesday, April 3, 2019 at 1 pm with Rev. Peter Long and Rev. Ron Carroll officiating. Music for the service was done by Heather Flieger and the songs were “Sheltered in the Arms of God” sung by Heather Flieger, “God Sent and Angel Home” sung by Jacqueline Flieger and “Go Rest High on That Mountain” sung by George Comeau. The eulogy was done by Yvonne Isaiah. Honorary pallbearers were John Johnson and Glen Glidden. Pallbearers were Arthur, Billy, Frank and Michael Flieger, Auston Lamb, Donald Brideau, Mark Kelly and G.P. Kelly. Interment will be held in St. Michael’s Cemetery later in the spring.